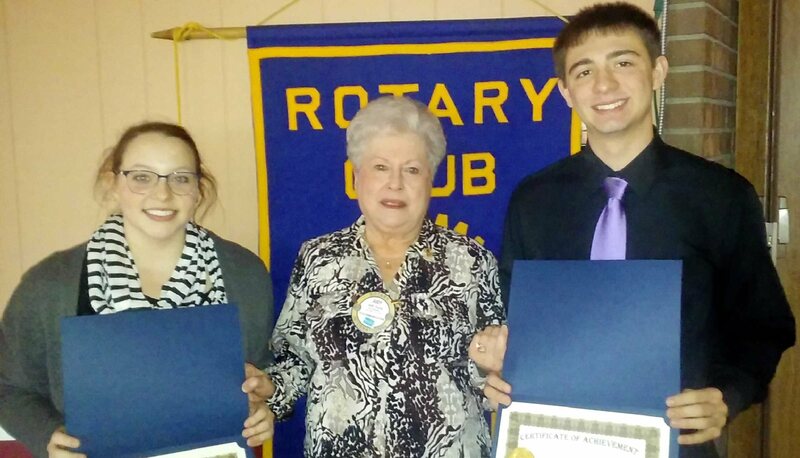 FULTON – Fulton Rotary Club Youth Activities Chair Judy Young, center, presented the club’s youth achievement awards to G. Ray Bodley High School seniors Ayrelle Barbagallo, left, and Trent Berry. Ayrelle has been active in many sports teams, including serving as captain on the volleyball, basketball and softball teams, and has volunteered for community sports. She is a member of the National Honor Society and vice president of the Academic Honor Club, and plans to study physical therapy at either Nazareth College or Daemen College. Trent has been enrolled in Advanced Placement and honors classes during his high school career, has received several academic awards, and is an officer of the National Honor Society and Math Club. He is first chair trumpet player in the school’s Wind Ensemble and lead trumpet in the Jazz Ensemble. He plans to attend SUNY Fredonia to major in music education.